New discoveries about the behavior of light were essential to the later development of camera lenses and photographic recording processes. 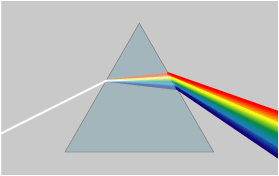 One of the most important such discoveries was made by Isaac Newton (1643-1727) about 1664 when he placed a prism in a beam of sunlight and discovered that white light is composed of different colors. His experiments went on to prove that those colors can be recombined to create white light again. Prism Rainbow Schema. Wikimedia Commons. Accessed: 22 July 2010.